Valerie Percival is an associate professor at the Norman Paterson School of International Affairs and a senior fellow at the Canadian International Council. A woman carrying a baby on her back jumps as she tries to avoid stepping in the dirty water in Beira, Mozambique, on March 27, 2019. 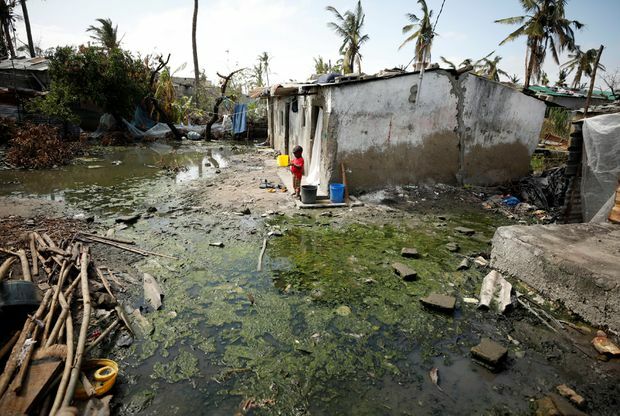 In the middle of March, Tropical Cyclone Idai – described by some as the worst weather-related disaster in the southern hemisphere in history – made landfall in Mozambique. For two days, the cyclone pummelled the city of Beira, home to more than 500,000 people, with winds of up to 170 kilometres an hour. Idai unleashed a six-metre-high storm surge that damaged 90 per cent of the city before it moved west into Malawi and Zimbabwe. An estimated 1.8 million people in the country alone live in affected areas; at least 700 people have been killed. The cyclone left a path of devastation and human suffering in its wake. It wiped out roads, burst dams, submerged villages and destroyed houses, schools and health clinics. Flooding ruined crops at the end of the growing season. Media feeds showed haunting scenes of people clinging to trees above raging torrents, crowds on rooftops surrounded by water, parents up to their neck in water with children on their shoulders and people clamouring for grains of rice. An inland sea, formed by flood waters and swollen rivers, continues to hamper rescue efforts. There is little electricity or clean water in affected areas. Health experts warn that disease outbreaks are likely: Mozambique is no stranger to cholera, and the first cases have already been reported; the incidence of diarrhoea is increasing. In a region known to be at risk of natural disasters, it seems as if authorities weren’t well-prepared – but they tried. Requests for assistance came early. The cyclone emerged out of a tropical storm that caused flooding in Mozambique and Malawi prior to circling back to the ocean where the storm intensified. 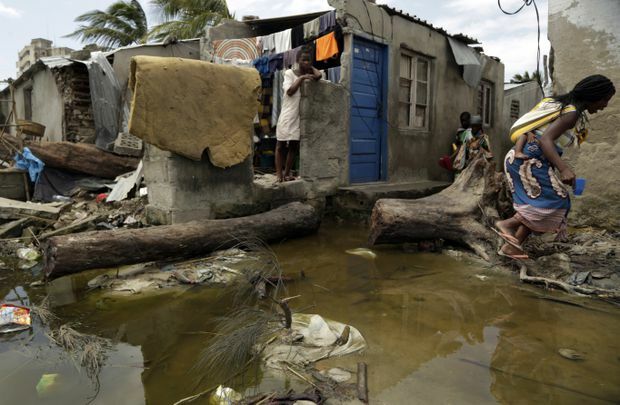 The Mozambique government issued a “red alert” two days before the cyclone’s landfall, requesting financial support for relief efforts. The United Nations launched an appeal the day after the cyclone struck – on March 16 – with an initial request of US$40.8-million. And on March 21, the Mozambican government issued a diplomatic “Note Verbale” formally asking for all forms of international assistance. The impact of the cyclone simply overwhelmed the limited national-response capacity. Some countries immediately stepped up: Britain quickly provided £18-million ($31.6-million) and mobilized assistance. The European Union gave €3.5-million ($5.2-million). The United States deployed its disaster-response team, and India sent naval vessels. But Canada was largely absent for about a week after the cyclone struck, until Ottawa announced its contribution of $3.5-million to the humanitarian response. A child stands amongst pools of stagnant water in Beira, Mozambique, on March 27, 2019. Better late than never? Of course. But what is really needed is a response that goes beyond writing cheques in support of relief efforts. There is still an opportunity for Canada to emerge as a leader in the reconstruction efforts. And there is a historical precedent. During the previous large-scale natural disaster to hit Mozambique, in 2000, Canada co-sponsored a general assembly resolution calling for more support and outlining principles for international engagement. Canada frequently used to exercise this leadership to mobilize other countries to act. Our government led efforts to reflect on the long-term causes of humanitarian crises and support research and innovation to promote more effective humanitarian responses. However, a scroll through Global Affairs Canada’s website reveals a focus almost entirely on the empowerment of women and girls. This is a critical objective and must be integrated within our international engagement, but it seems to depend on women and girls to be the sole agents of change. The empowerment of women and girls requires an enabling and equitable economic context, good government, safety and security, access to social programs and protection from the effects of climate change. Without that solid foundation, other worthy causes become impossible to pursue. From our national governments and like-minded partners, we need to build and enable local, national and regional capacity, resilience and response, which includes efforts to mitigate against the effects of climate change. What would that look like? First, we need to push for further innovation in our development programming, particularly related to disaster-risk reduction. UKAid spends 3 per cent of its annual budget on research. A similar commitment from Canada would facilitate innovative research and support the flow of information and ideas between researchers and humanitarian and development practitioners. To be effective, such partnerships cannot be limited to Canada. They must include individuals and organizations from affected countries. Second, we must make real investments in national organizations and regional response mechanisms. Compassion is fickle, dependence on international benevolence is dangerous and it perpetuates and reinforces the control of the aid and development agenda by rich countries and well-funded organizations. Canadian-funded relief organizations must be incentivized to provide their national staff members and implementation partners with meaningful training and educational opportunities. This would ensure that groups have skills and agency to manage national responses and navigate the aid system. The private sector, including private capital, could be mobilized through mechanisms such as social-impact bonds related to disaster-risk reduction. Third, there are incredibly smart, hard-working and dedicated individuals working to design and deliver Canadian assistance programs. But too much of their time is spent on cumbersome and inefficient bureaucratic processes rather than the substance of our international engagement. Global Affairs Canada needs an overhaul. It must be able to quickly and effectively respond to crises. To do so, it needs to value expertise, including sector-specific knowledge as well as diplomatic experience. The reward and incentive structure should promote initiative and innovation among our diplomats and humanitarian and development partners, rather than risk aversion that manifests itself in slow and pedantic responses. Canada was once a strong voice for those affected by natural disasters and conflict. It can be again. But to do so, we need to renew our commitment to vulnerable populations and rethink what we prioritize when it comes to foreign policy and humanitarian engagement.